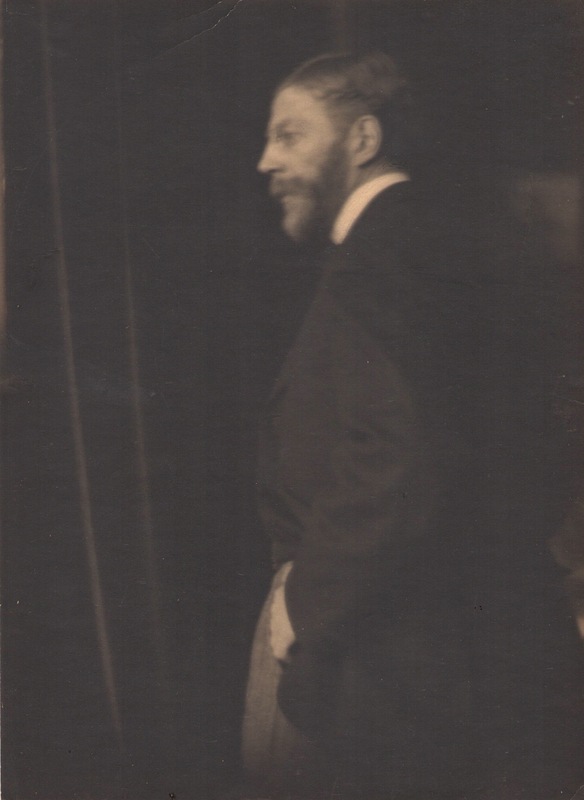 On August 1, 1914 when Germany declared war on Russia and two days later on France, Leon Dabo, NA, the French-born American artist (1864-1960), was 50 and past his “fighting days.” There are many stories about his service during the First World War. Some can be verified in multiple sources and others are stories that show up in single newspaper accounts or biographical sketches in major art reference books such as Benezit, Fielding and Theime-Becker. In preparing this essay, the authors have made every effort to reconstruct the artist’s life as factually as possible. This essay covers his life from the months leading up to the War, through the War years, concluding with Dabo’s return to the U.S. following the War. Photo of Dabo, the “Poet of the Night” by noted pictorial photographer Clarence H. White c. 1914. Courtesy of Dabo Estate. Before being ‘shipped- over’ Dabo has a formal studio portrait taken in his new uniform, every bit the proud soldier “ready for the fight.” Photo by Gardner & Co., 276 Fulton St., Brooklyn, N.Y. Courtesy of the Dabo Estate. Exhibit in Maine and he is known to have lectured in Rhode Island in August. But that is the extend of his recorded travel. Not one to miss a good exhibition, he did prepare and send at least one submission that was accepted into the Pan Pacific International Exhibition in San Francisco which opened on New Year’s Day, 1916. The official supplement to the PPIE catalog recorded the title of that canvas as A Garden, No. 6822. However, documents in the possession of the New York Public Library indicate that on December 4, 1915, Dabo sent a more famous painting, Rockets, Rain of Fire to be exhibited at the PPIE. We may never know which piece was exhibited. The year 1916 was again marked by limited travel and only a half dozen group exhibitions. Dabo, who would eventually become a sought-after speaker, is known to have delivered three formal lectures which were reviewed in either the Brooklyn Daily Eagle or the New York Times. The nation’s focus was on the War. The draft was instituted, war escalated, and a million Allied soldiers were lost to the rigors of conflict. For Dabo, 1917 was a pivotal year. In the first quarter of the year, Dabo participated in four group shows and a major solo exhibition, featuring 26 canvases, at the prestigious Goupil Gallery in New York. The Goupil exhibition garnered positive reviews everywhere, including in the Brooklyn Daily Eagle, New York Tribune, New York Herald and New York Times. The review in the Eagle was consistent with the others: “This well known Brooklyn artist has added a sharp poignancy to his other gifts of interpretation. He departs from the path of detail in all his new paintings. And in its place he gives us rich colorful subtlety.” Dabo was at the top of his game. The exhibit closed on March 31, 1917. A few days later, on April 6th, the U.S. declared war on Germany and entered the fray. By the end of May, General Pershing was landing troops in France. Dabo had carefully shepherded his career up to this point. He even managed one more show a year later, a solo exhibition at the Chicago Art Institute. But essentially the meteoric rise of his career was over. The Chicago show went on to be received just as well as the Goupil Exhibit, but all eyes were on the War. Dabo, though his career would again flourish years later, was never the same. In 1918 Dabo was a celebrity. He was one of the most successful and prominent artists of his day. He was made a part of a quasi-official “American Mission to Investigate German Atrocities”  along with Dr. Newell Dwight Hillis, a prominent Congregational minister, and Lawrence Chamberlain, president of the American Banking Association, who would go on to raise funds via war bonds. They left for Europe in June of 1918 and returned after two months of travel along “the front” in both France and England. Just as celebrities are employed today, they were made part of causes in Dabo’s day. Dabo was the flag of this flagship voyage made to help Americans understand the extraordinary difficulties of the War. Dabo may have additionally been included in this exploratory group because he was fluent in most of the languages that were spoken by participants in the War. Following their return from this “investigation,” Dabo joined the speaking circuit in an effort to generate support for the American war effort, including the raising of funds through the “National War Savings Committee” and their bonds and stamps. “Near St. Gengoulph,” was completed late in 1919 from sketches made ‘in the field’ by Captain Leon Dabo, Aid-de- Camp to General Mark L. Hersey, for The 4th Division in the World War, published in 1920. Even though he was 52 years old, Dabo heard the call. As a translator, his services would have been invaluable. 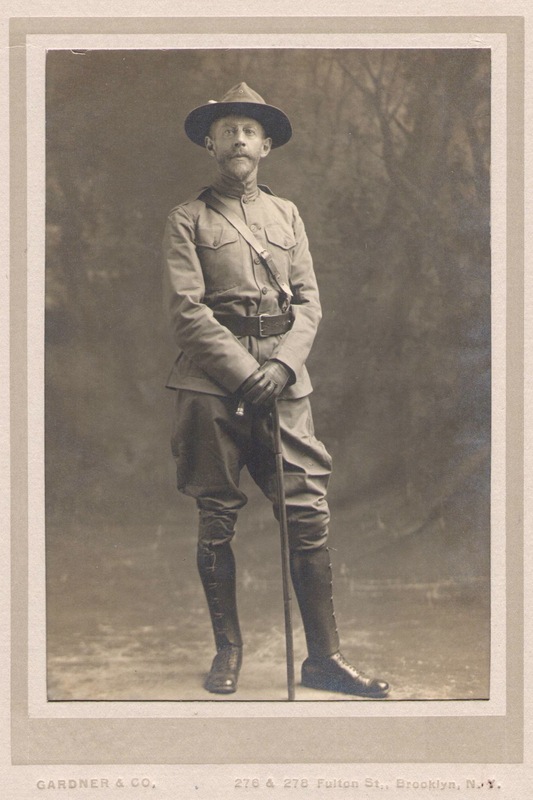 He volunteered, was presumably trained, commissioned as 1st Lieutenant and, by October 14, 1918 was stationed in Paris as part of the Corps of Interpreters for the 27th Division of the American Expeditionary Forces. He would have been in the thick of the final days of War. But he was only posted with the 27th for two and a half months. His translating skills were needed elsewhere. On November 11, 1918, the Allies and Germans agreed to the Armistice and armed conflict ceased. However, much was left to be done including the establishment of an infrastructure for Europe’s nations, an exchange of prisoners, reparations and the complete demilitarization of German ground, air and naval forces. Original tissue “copy” of Special Order No. 8, 1/8/191 transferring Dabo from General Head- quarters AEF to the G-2 Section of Commanding Officer, General Mark L. Hersey of the 4th Division. 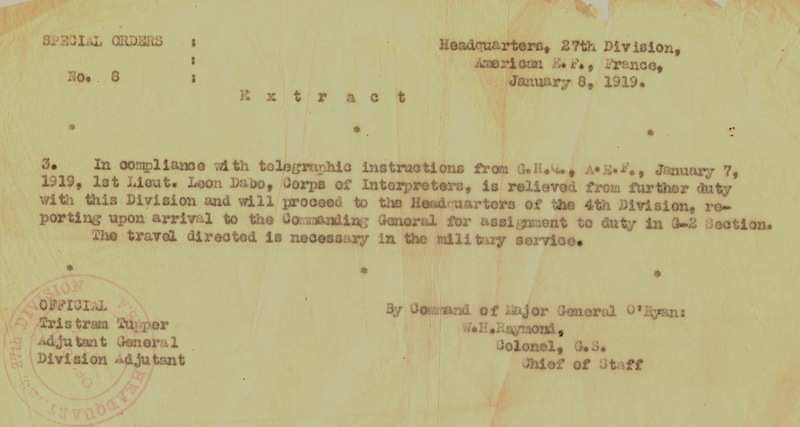 On January 8, 1919, Major General O’Ryan’s Command issued orders transferring 1st Lieutenant Leon Dabo from the 27th Division led by General Jack Pershing to General Mark L. Hersey’s Headquarters in Germany at the 4th Division where he reported “to the G-2 Section.” The reason for Dabo’s transfer is lost to the folds of time and the mystery of all things related to “G-2 Intelligence,” but it may have been done to strengthen General Hersey’s HQ staff with an experienced translator. On March 31, 1919, Acting Chief of Staff, W. H. Clendenin, of the 4th Division, AEF, Second Section, recommended that Dabo be promoted to the rank of Major. In his testimonial letter, Clendenin sets forth the reasons for the advancement in grade : 1. Dabo’s service to the Secretary of the American Financial Mission in the previous summer; 2. 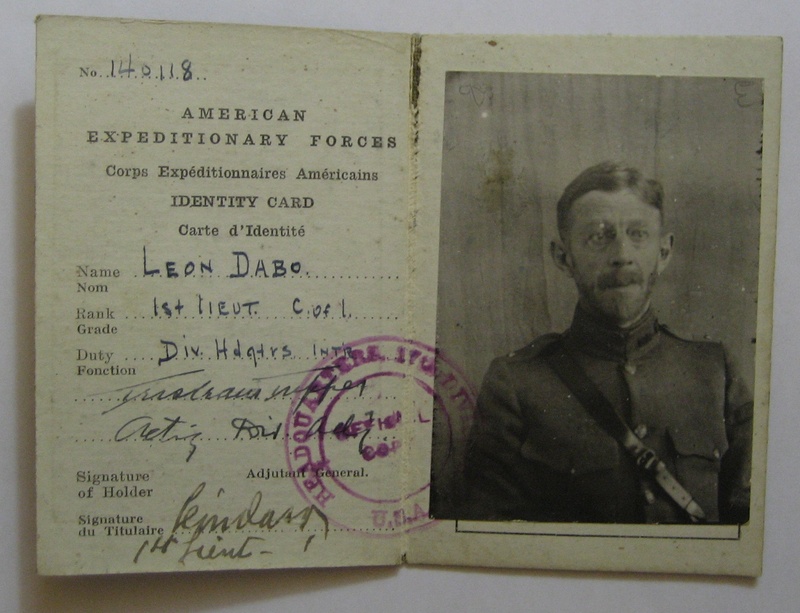 His travel and service in support of a Liberty Loan Campaign at his own expense where Dabo personally raised “two hundred twenty seven millions worth of Liberty Bonds;” 3, Service with the Department of Justice in “diplomatic inquiries.” Clendenin also reported Dabo’s efforts with the 27th for working with British forces when he was with the 27th. 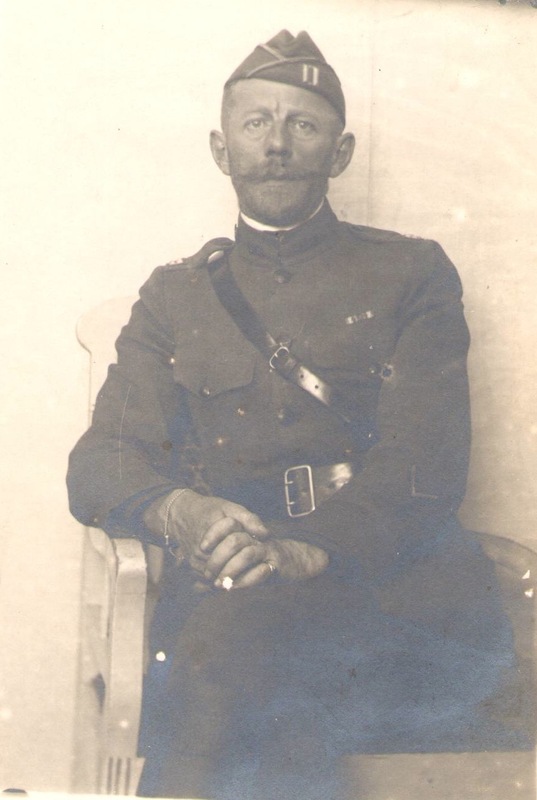 Finally, he recounts that Dabo was “an accomplished linguist,” being “thoroughly familiar with French, German, Spanish, Italian and other tongues too numerous to mention.” Though not advanced to the grade of Major, Dabo was promoted to Captain “by order of the Secretary of War,” effective April 27, 1919. Dabo pictured in his captain’s uniform, but with dark circles under his eyes and a worn visage. 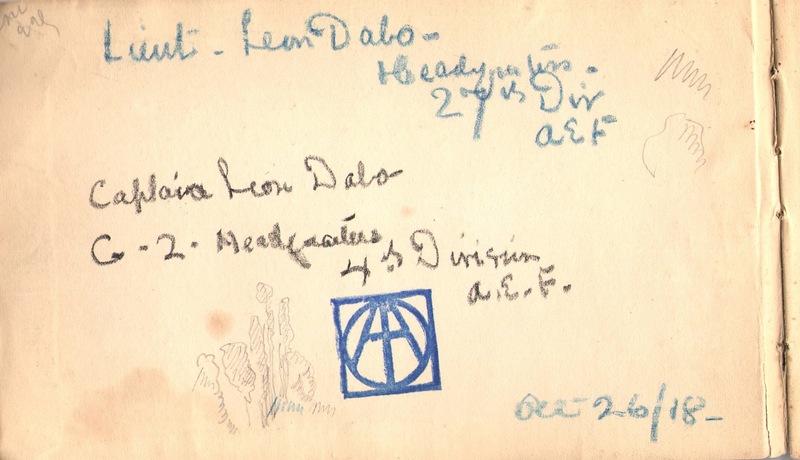 On the verso of this photo, Dabo has written “27, June, 1919 …Berlin la veille de la sig- nature de la paix” (trans: “Berlin on the eve of the signing of the peace”). Courtesy of Dabo Estate. Though the cause is unknown, there is a record of Dabo having been hospitalized from May 21 to May 31 at Base Hospital No. 91, in Commercy, France , not far from where Dabo was born. Subsequently on June 9, 1919, Dabo was again hospitalized, but this time at Riens. Somewhere in the final weeks of Dabo’s assignment, he was commissioned to illustrate the official history of the 4th Division which was published the following year. In the final months of the War, Dabo traveled via an army-supplied car from Bad Honningen to Kolbenz in Germany and on to Hautevesnes, then Paris and eventually to Brest, France where he was booked aboard the U.S.S. Mobile for return to the U.S. On September 3, 1919, Captain Dabo was honorably discharged from the U.S. Army at the Port of Embarkation, Hoboken, New Jersey. He was commissioned on October 14, 1918 and discharged nearly 11 months later at the age of 53. It is not hard to imagine the smart looking, uniformed Captain, standing on a wharf in Hoboken, wondering how he would return to civilian life. Clearly, Dabo left his chosen field to serve his country. He was in Paris in 1914 when Germany declared war on France. In 1917, at his own expense, he traveled the U.S. to sell war bonds. Early in 1918, he visited the front and personally saw the devastation of war as part of the American Mission to Investigate German Atrocities. Finally he volunteered for service at an age when few would do so. 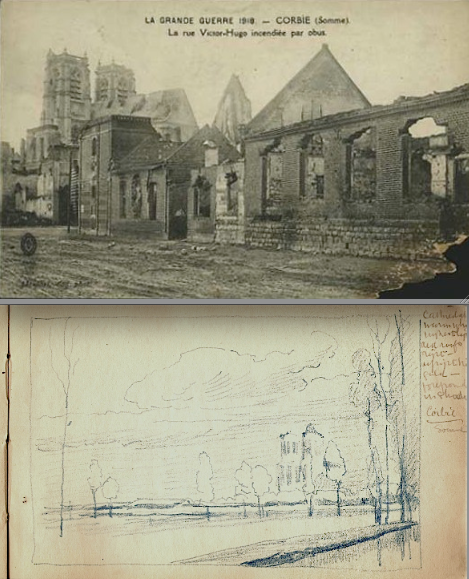 “Corbie Cathedral, Somme,” conte drawing by Dabo c. October 1918 from Sketchbook No. 3, paired with WWI postcard of Corbie from same period with Cathedral in background. Courtesy of Dabo Estate. he was able to find a few moments to return to his artistic endeavors. He carried a small sketchbook in his duffel bag for the duration. However, there are only two dozen pencil or conte drawings in the sketchpad. 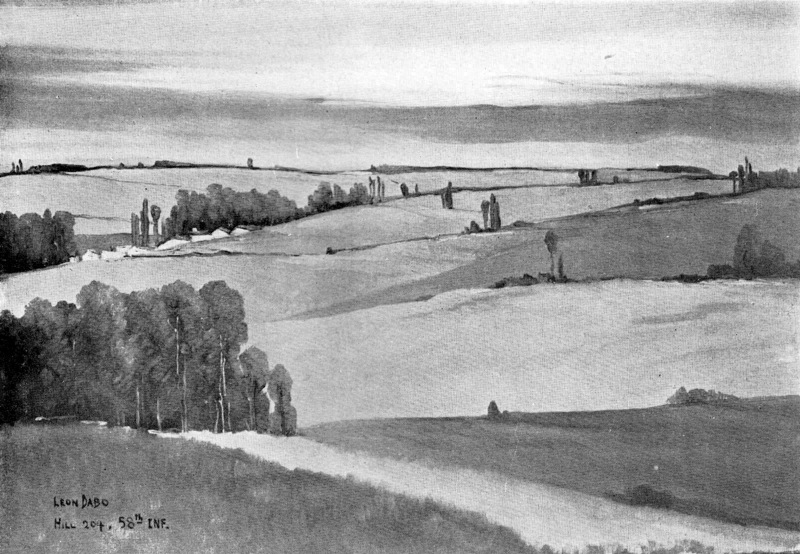 After the conclusion of the War, he painted a number of sketches “in the field” from which he painted canvases that served as illustrations for the 4th Division’s formal published history. Effectively, Dabo’s patriotism ended the first great portion in his career. But perhaps unbridled patriotism was not the only reason for the decline in Dabo’s recognition. The start of the Great War marked the end of the La Belle Epoque. It was an era marked by extraordinary achievements in music, literature and science. Celebrated composers included Camille Saint-Saens, Maurice Ravel and Claude Debussy. Marvelous literary contributions were made by Marcel Proust, Henry James and Thomas Mann. The sciences blossomed into creations like the electric light and the Eiffel Tower. Advancements in medicine led to the new field of psychoanalysis. In turn this progress that led to interest in the unconscious and dream, the very elements that would form Dabo’s iconography. The art world was not without its other contributions. La Belle Epoque was the garden where blossoms included Art Nouveau, the Nabis, Jugendstill, Fauvism and the Symbolist movement. The start of the War signaled the end of nearly all of these movements and the conclusion of La Belle Epoque. 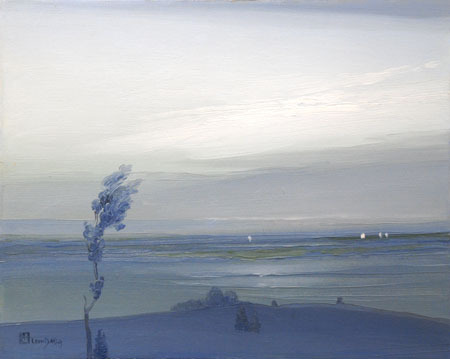 Across the Hudson, Lone Tree by Leon Dabo, o/c, c. 1907, 16″ x 20″ was painted in the heart of La Belle Epoque and the center of the first maturation of Dabo’s artistic career. The richness of the period, the calming sense of peace, and the notion that aesthetic beauty should be part of everyday life, allowed collectors to focus on the quiet, rich depth and pure intellectualism of Dabo’s paintings. Where scientists worked to understand dreams and the unconscious, Dabo employed them as entry points into his private labyrinth. When the sounds of battle invaded the City of Light, the Epoque that had started so brightly faded to the intense black of misery. Dabo would again return to fame as an artist, but never so successfully as during La Belle Epoque. A shipping manifest is amongst the papers in the New York Historical Society’s “Leon Dabo Papers.” Other than the Dabo Estate the largest holding of Leon Dabo’s ephemeral material and personal records is the holding at the New York Historical Society. The entire Dabo archive is currently undergoing an organization and cataloging. Carbon copy of Special Order No. 8, January 8, 1919, Headquarters 27th Division, AEF, France, a copy of which is in the Dabo Estate. Carbon copy of Special Order No. ?? ?, March 31, 1919, Heaquarters 4th Division, AEF, France, a copy of which is in the Dabe Estate. Christian A. Bach and Henry Hall Noble, The Fourth Division: Its Services and Achievements in the World War, Gathered from Records of the Division, Privately Published by the Division Association, 1920. Discharge Papers for Captain Leon Dabo, copy in Dabo Estate and another copy in the NYHS. There are 22 sketchbooks known to exist: two are at the Frick, two at the Cooper-Hewitt, two at the University of Michigan, one at the 42nd Street Library in New York, and 15 in the Leon Dabo Estate. Sketchbook No. 3, in the Estate is devoted to drawings done during WWI.